Power catamarans may be the boats of the future. 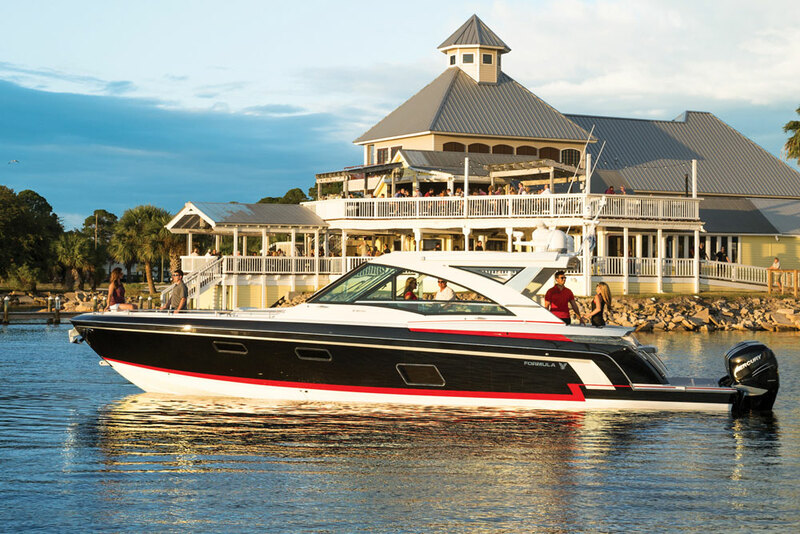 Power catamarans like the new Leopard 43 pc are a fast-growing segment of the boating market. Combining speed, fuel-efficiency, comfort, and easy handling, there’s much to like—but I wanted proof. So, eschewing the usual single-day boat test, I chartered a Moorings 433 (a Leopard 43 pc with three cabins) for a full week in the British Virgin Islands to find out what the fuss was about. We picked up our boat at The Moorings location in Tortola, the busiest charter base anywhere. 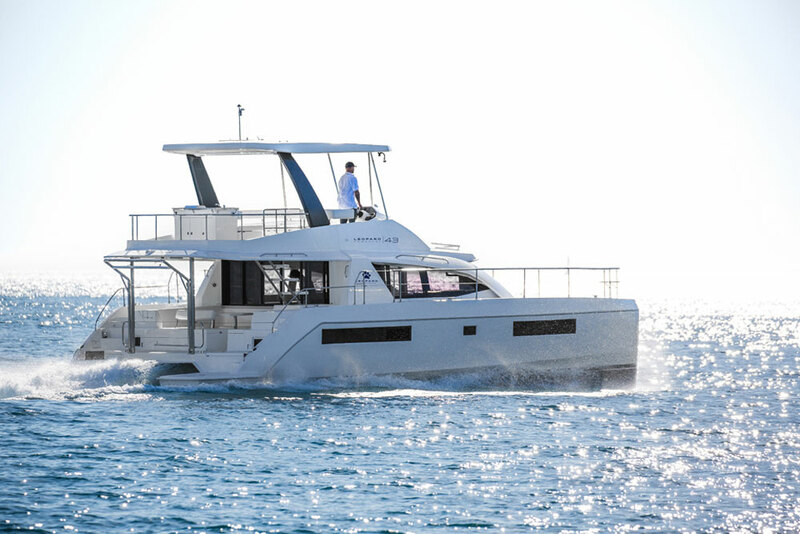 Our 2016 owner’s version power catamaran was named Rubis, a couple-sized platform that soon had me falling in love. 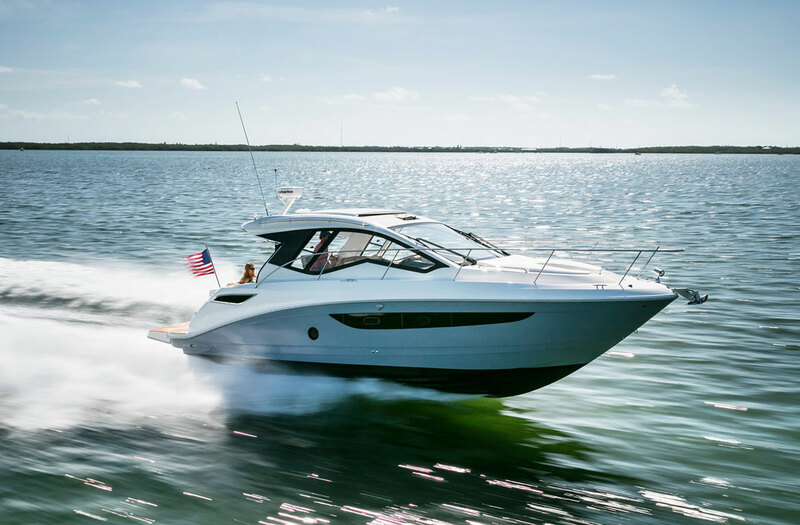 The fact that the boat test took place in paradise didn’t hurt, but it was the Leopard 43 pc itself that made me think about a whole new way to go boating. The Leopard 43 was designed by Simonis Voogd and built by Robertson and Caine in Cape Town, South Africa. 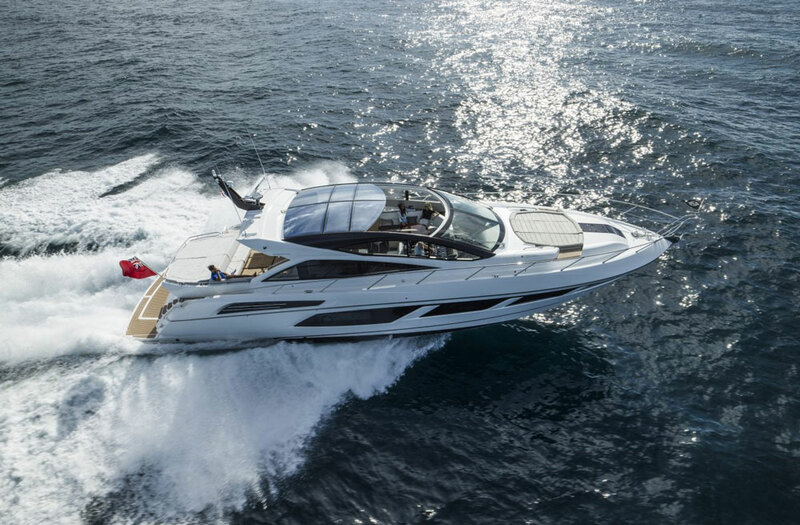 She nips at the heels of her bigger sister, the Leopard 51 pc, and can nearly match it in speed (23 to 24 knots at wide-open-throttle) with 300 fewer horses. Anxious to get the numbers down early in the trip, we put the twin Yanmar 220 HP diesels to work. Note: 40-something-foot monohulls would have engines twice that size. But cats don’t drag a wide hull through the water (think of the hulls like two knives, versus a single spoon) and so can operate with smaller propulsion systems. Besides the fuel-sipping engines, some of this efficiency comes from the hull design. They are narrow at the waterline for better hydrodynamics but flare out with a hard chine that creates interior volume. We topped out at 20 knots because The Moorings keeps the engines governed down to 80 percent, which is probably smart in charter. At that speed, we burned 25 gallons per hour at 3650 RPM. When we settled down to a comfortable cruising speed of 14 knots, we burned 14.8 gallons per hour or about a gallon per mile. That was to be our normal speed for the rest of the week, with the occasional burst to 18 knots just for fun. At the end of the week, we had only burned 105 of the 264 gallons on board—and we were not trying to be frugal. Most cats have the engines inside the transoms. That puts a lot of weight far aft and with a genset and water tanks forward, this can set up a hobbyhorse motion. The engines on the 43 pc are farther forward, under the aft bunks, which somewhat alleviates this problem. It was a surprisingly quiet and vibration-free arrangement on Rubis. Electrically-actuated platforms rise to reveal engine access. It really couldn’t have been easier to move around on the deck of the 43 pc. The foredeck was solid (no trampoline) and spanned her entire beam, which made picking up moorings easy. I moved from side-to-side with no toe-stubbers or level changes. I braced my hips on the stainless-steel railing (which runs the perimeter of the deck) and reached down with both hands free to put lines on cleats. The side decks were wide and very easy to negotiate, even with our two SUPs tied on the port side. A long grabrail on the cabin house helped to keep us steady and made a great place to tie on the boathook and deck brush. From the foredeck I stepped through the full-sized forward door into the saloon. It was the fastest path to get inside, to the cockpit, or up to the flybridge. When open, this door ventilated the interior and cooled it down fast. The cockpit has a U-shaped settee to port and a short chaise lounge of sorts to starboard. An enormous liferaft locker doubles as an aft seat. Its hinging backrest allowed us to face forward or aft, depending on its orientation. The whole cockpit was covered and protected by my favorite feature, the flybridge. The steps up to the fly wound around in an L-shape and were pretty easy to negotiate even with both hands full. Solid rails gave us something to hold onto or lean against, although the steps themselves seemed an inch or two taller than normal and were a bit awkward. The flybridge was the focus of our week on the Leopard. Up on the bridge, a galley module aft had a Kenyon electric grill and sink. An option on the Leopard 43 pc is to add a refrigerator and/or an icemaker. Forward and to port was our main refuge: a U-shaped settee that wrapped around a low table that’s the same size as the one on the 51 pc. 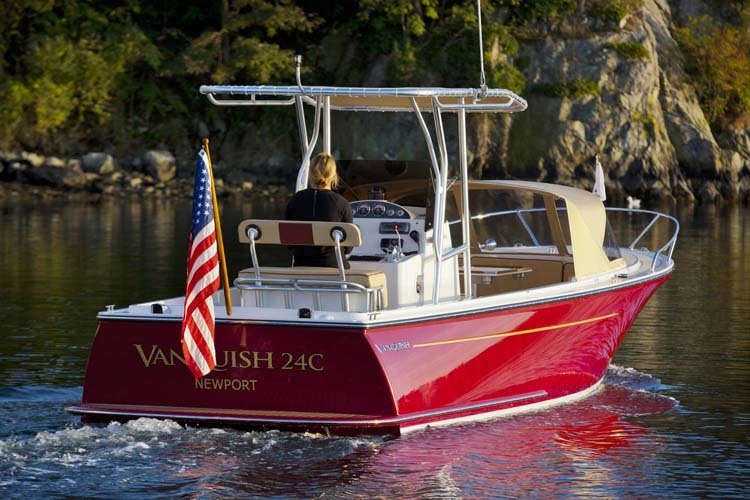 To starboard was the helm that included a double bench seat and an angled dash with two Raymarine MFDs. We used one display for navigation and the other to keep tabs on systems including fuel, water, batteries, and engine data. The autopilot was behind the wheel and the VHF was to the side. The engine throttles were outboard and properly positioned, especially for a right-handed driver. The entire space was covered from the sun and rain by a hardtop that comes standard and creates a place from which to hang a full enclosure. In sloppy seas the fiberglass top did make crazy creaking sounds, which I hope Leopard addresses in subsequent builds. It was best to leave the wheel centered and untouched when docking, anchoring, picking up a mooring or sightseeing in a narrow anchorage. Using just one engine at a time, I had precise control. No side thrusters or pod drives were needed. With four-bladed props set nearly 20’ apart, the boat was responsive and so much fun to handle that when we picked up a mooring, we would fight as to who got to drive. Sometimes we would pick up numerous moorings or re-anchor under the auspices of getting a better spot but truth be told, it was just fun, and completely stress free, to maneuver. Communication between the driver and the crew on the foredeck was remarkably civilized. No raised voices or incomprehensible gesticulations necessary. We could hear each other at normal conversational tones and see each other clearly so the helmsman always knew what the crew was up to. A surveyor once told me that my monohull was only “half a boat”. Spreading out inside, I was starting to understand his point. 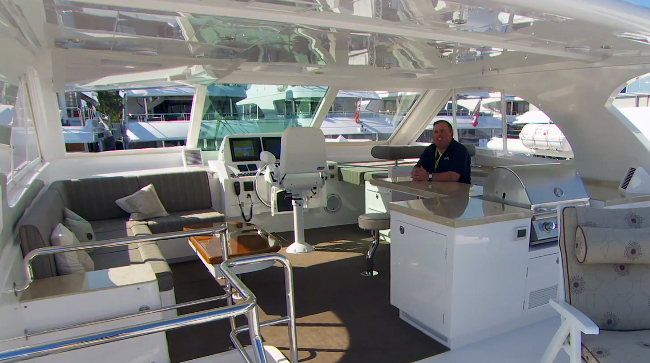 A 43’ catamaran feels approximately the size of a 50-plus-foot monohull. To maximize the spacious feel, Leopard has rearranged their interiors so that the saloon dinette butts up against the cockpit settee and you can sit back to back. With the door and windows open it was a connected space that had nice flow. The forward-facing, L-shaped galley was in the starboard corner. To port and next to that great door was a small navigation desk that became the charging station for phones and cameras because there were four USB ports mounted in the bulkhead. Leopard offers an option to add engine throttles and an autopilot here, to make an interior helm station. The Moorings doesn’t have this option and we didn’t miss it. 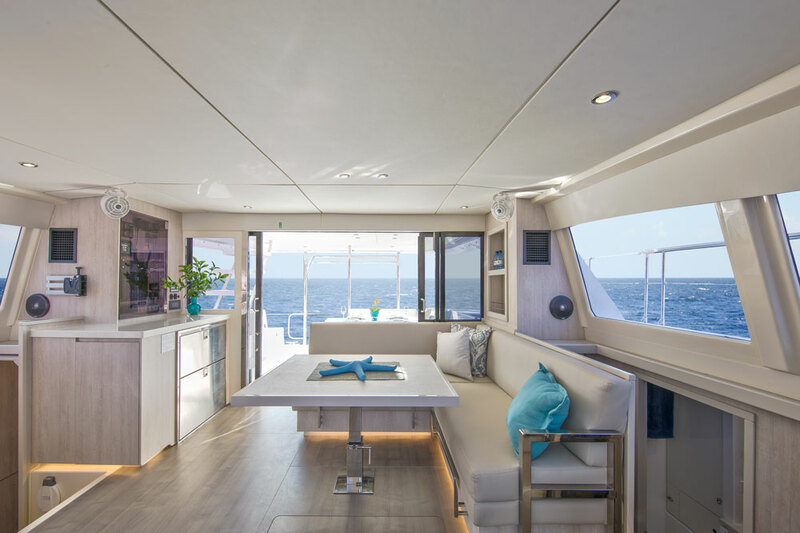 A spacious feeling and lots of elbow room is one of the big perks of spending time aboard a power catamaran. The master stateroom in our owner’s version took up the entire starboard hull. It was palatial and I think I could live aboard without feeling like I was camping. A queen-sized bed aft and a large head forward were separated by a vanity, a chest of drawers, and two enormous lockers. The shower stall forward was large and had an access door to what could be a space for a washer/dryer combo in the bow. Two cabins shared a head and stall shower in the port hull. A four-cabin, four-head version is also available. Stowage space in the saloon and the cabins was excellent and allowed us to be downright wasteful with food, clothes, and toys. With two hulls and the saloon spanning the bridgedeck, Rubis felt as big as tennis court and we never got in each other’s way. The first night we experienced another reason that cats are so popular. We sat steady at anchor, with nary a wobble in an uncomfortable bay. Cats may slosh about a bit but they don’t roll, and that makes gyroscopes or stabilizing fins unnecessary—and sleepless nights, forgotten. The BVI is chock full of sailboats but power cats are making inroads quickly. With the short distances and headwinds, sailboats barely have time to set sail before they find themselves dropping the hook so the islands—like many places—are perfect for a powerboat, and specifically a power catamaran. I found few things to complain about on the Moorings 433 but some features could be improved. I would like to have had a larger electric winch for the dinghy davit. It constantly got an override on the drum and would trip the breaker five times on each raising. The windlass was also undersized and tended to spin out, needing the brake to stop the chain from rushing out. That said, the windlass had its own dedicated compartment so both it and the chain were covered, making things both cleaner and safer on deck. 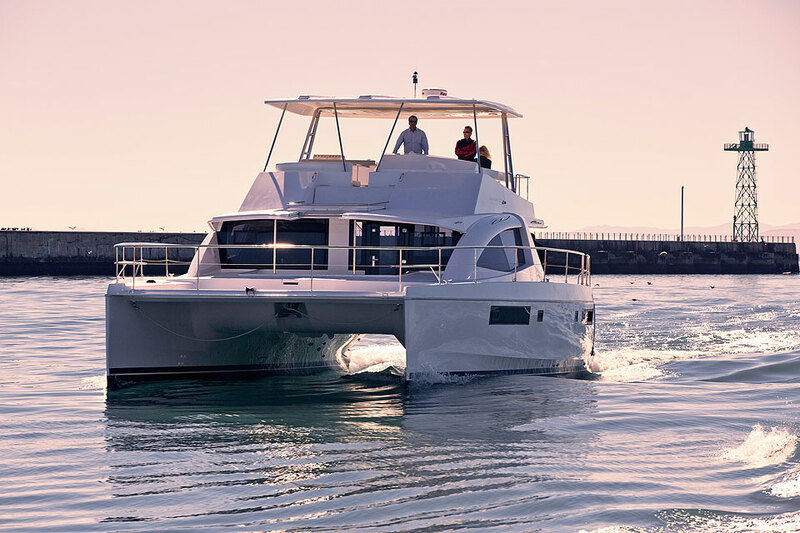 Robertson and Caine expects to build about 30 of these new models per year, with some percentage dedicated to The Moorings and others for private ownership. Chartering one out may be the easiest way to “try before you buy,” and decide if you’re ready for more than half a boat. 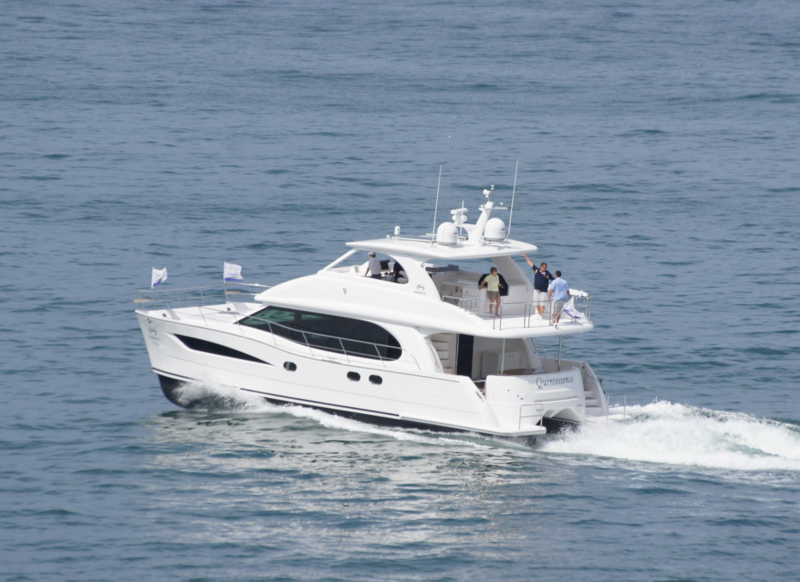 Other Choices: The Aquila 44 is a similar-sized power catamaran, and this one’s also available for charter (via MarineMax Vacations). 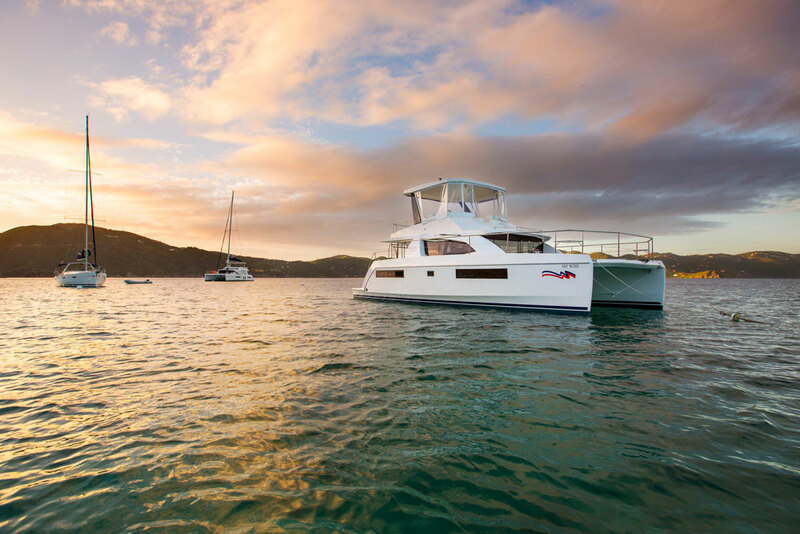 A slightly smaller option offering similar performance is the Fountaine Pajot Summerland 40. 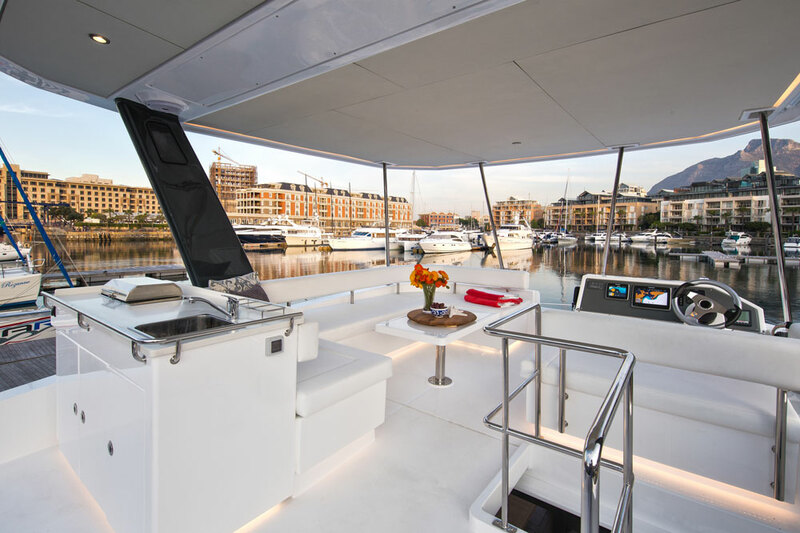 For more information, visit Leopard Catamarans. See Leopard power catamaran listings.